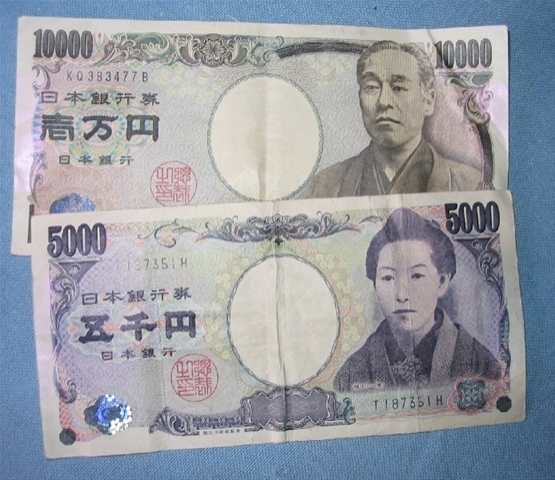 I’ve now collected my currency and have some Yen. 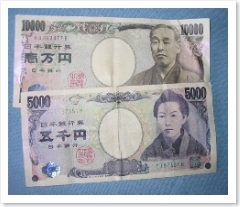 I only have two types of note 5000 and 10,000 (roughly £22.50 and £45.00). This time next week I’ll be on the plane! Well that’s proved that posting by the “Japan Moby” works. So as long as I can do the same when it’s using DoCoMo in Japan I’ll be away. Checked train times, 5 hours between Hiroshima and Tokyo! Should have the “take to Japan” phone Monday or Tuesday so that will need to be set up. I also need to do a bit of work on learning some basic Japanese phrases, especially the numbers. 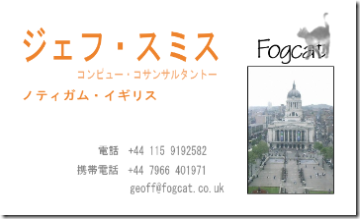 The business cards (meishi) arrived today so I can join in the exchanges.Never hurts to make contacts. Ok, so it’s not that much more detailed, but there are now some links to where I’ll be staying and you’ll notice a couple of unconfirmeds. On Friday the 13th I’m planning on finding a capsule hotel; well I’m in Tokyo, it’s just got to be done really. 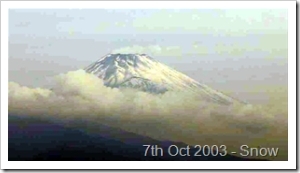 On Wednesday 4th I’ll be in the Fuji area, if the weather is mild I’m still tempted to do a night hike up Fuji-San to watch the dawn from the top. But October is well outside the climbing season (July & August) so I’m not sure what the conditions will be like. So on the other hand I could just find a cheap hostel. It is danger especially to climb in winter, from October to May. For a more “wild” experience I would suggest climbing the mountain in October. From October to May, climbing to the summit is highly perilous due to extreme wind and weather conditions and a high risk of avalanches. So a hostel it is then I think…..